Bath time has never been this fun! Build with the stackable friends made for watery adventures with Mega Bloks® First Builders™ Build ‘n Splash. Your child can now build in the bath with First Builders blocks! 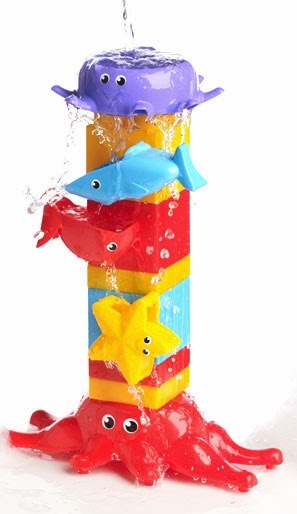 Use the suction cup to stick the friendly red octopus to the bottom of the tub and stack his fishy friends on top of it to create a fun waterfall for your little one to watch! Pour water on the squid’s head and watch the cascading effect as the starfish spins, the shark dips and the fish catches the water. Combine with other First Builders sets to raise your seaworthy friends out of the water and make your waterfall higher than ever! When bath time is over, place all of the Build ‘n Splash friends inside the handy draining basket that can stick to any surface thanks to its own suction cup. Ideal for kids ages 1 to 5. ©2014, MEGA Brands Inc. All rights reserved. MEGA BLOKS and FIRST BUILDERS are trademarks owned by MEGA Brands Inc.
Mega Bloks® First Builders™ Build ‘n Splash! This would be great for my toddler. She has just started to like taking a bath and these would be great for her. So neat! My son would love these toys! We love bath crayons and paint! We love funnels and some bubbles!! !